This is a must have for any Chiminea Owner. All clay and cast iron chimineas should have some kind of spark arrester. Our chiminea lids serve several functions. One being to help keep rain water out of the chiminea. The other is to keep ashes from blowing straight up in the air to catch leaves and such on fire. Then it also helps to divert the heat side ways to keep everyone warmer. What happens is the smoke and embers fly up and hit the top of the lid and reflected back towards the ground.If a screen is installed the screen catches the embers before hitting the lid and then the lid is reflecting the heat and smoke. What happens is there's fire in the belly of the chiminea and heat rises. So when the heat is blowing up it blows through a much smaller opening at the top of the chiminea creating a powerful blast and taking all the loose embers in the belly with it. These embers could fly 10 to 12 feet in the air and that's not something we want and these could be sizeable embers. If your wanting to use your chiminea under a cover area this lid will help divert the heat and smoke but use caution. Plus our lid is a rain cap as well. When it rains it will help keep your chiminea from filling with water. It will only help. 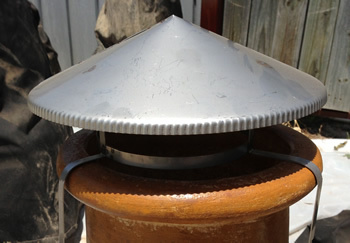 The surest way to keep water out of your chiminea is to remove the cap and put a cover over the chiminea. Our Chiminea lids fit almost every chiminea I have seen made. The lid measures app. 12" in diameter and 6" tall. It's completely adjustable to fit a chiminea as small as a 7 inches of the outside diameter of the smoke stack. Comes in either a painted flat black Stainless or MILL (bare steel) Stainless. The design of the lid may differ a little then pictured as these are hand made. We do not warranty the paint! It will change from the heat of the fire. This is a must have for all chiminea owners!